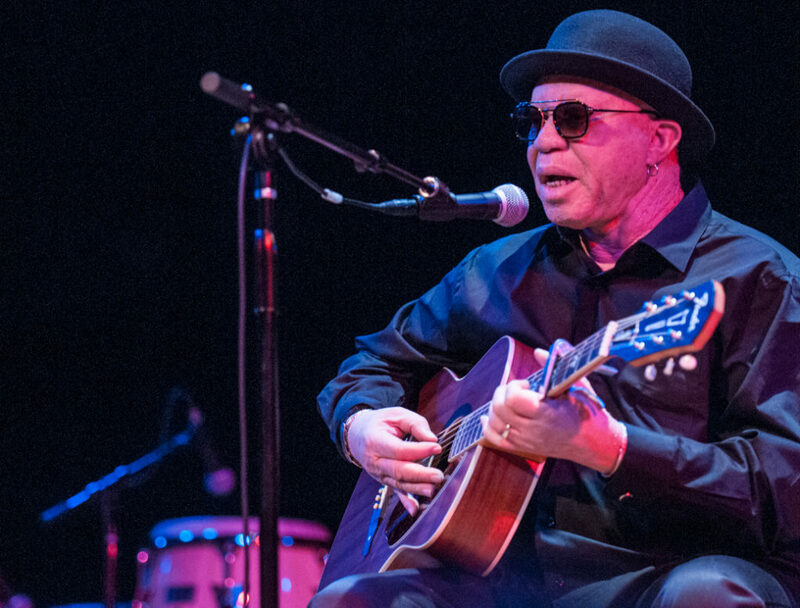 It is always an occasion when Mali’s most renowned popular singer Salif Keita comes to town. 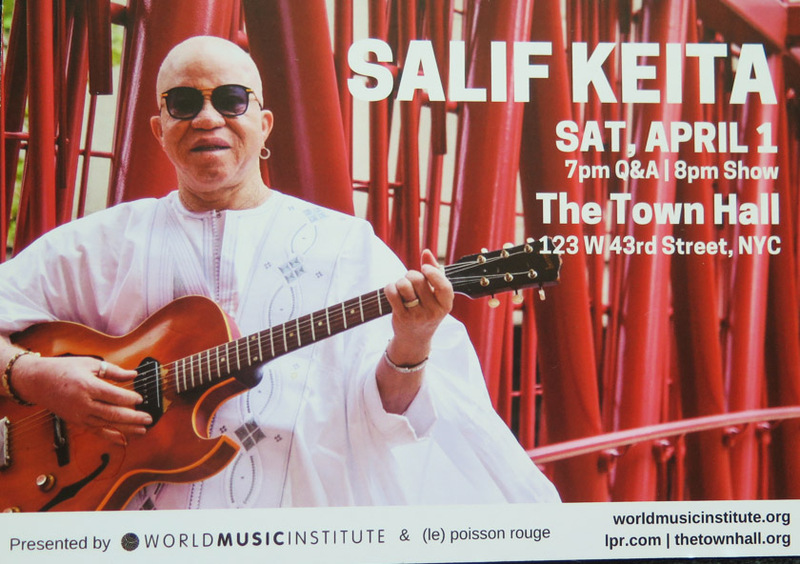 His first visit to New York in three years drew a nearly full house to Town Hall on Sat., April 1, presented by the World Music Institute and Le Poisson Rouge. When it was all over, the audience seemed dazed and beaming, and that's because there is something physically therapeutic about hearing this man sing. Though he never sings in English, you hang on every note and every word, as if he were reciting a cliffhanger tale. And when he builds to those blast-force gut cries, as on his immortal song for Guinean strong man Sekou Toure, “Mandjou,” it’s as if a cleansing dry wind has blown through the most inaccessible corners of your heart and soul. There is simply nothing like it. Keita gave a classic performance, beginning with his trademark kneeling greeting to the audience, and ending with a stage full of dancers behind which he quietly slipped away, not to be seen again. In between those signature gestures came a set of mostly familiar songs ranging from contemplative to ecstatic, and delivered with the joyful precision one always expects from Keita’s band. The band is smaller than it used to be. 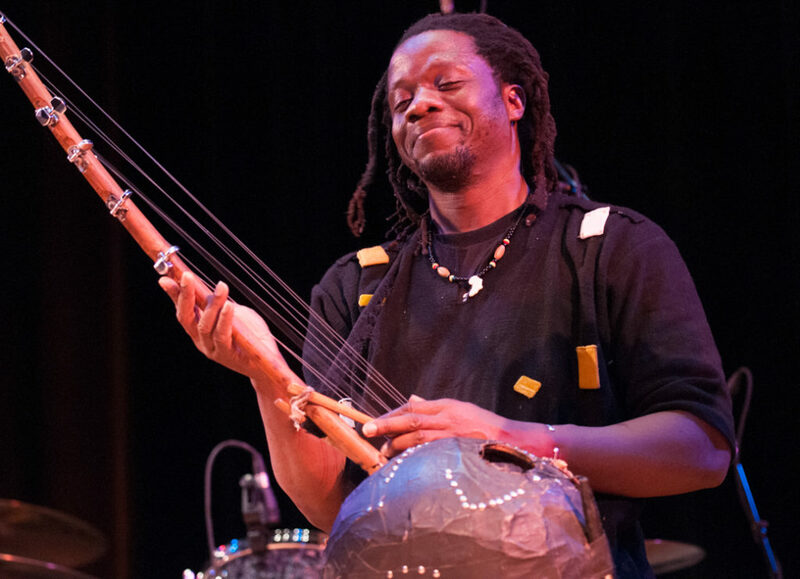 “Sequencer” Abou Cissé handles the roles of bass, keyboards, percussion and more, laying down beds that make a relatively small stage combo sound grand and full. 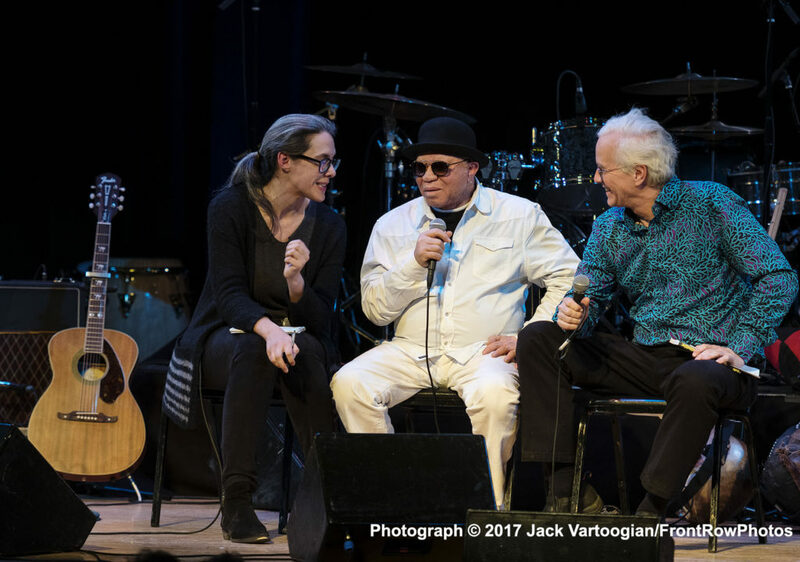 [caption id="attachment_35771" align="aligncenter" width="601"] Salif Keita, Town Hall, New York (All concert photos, Eyre 2017)[/caption] Last time Keita was in town, he presented as a griot, the band seated with kora and ngoni (Mande griot instruments) interacting with veteran Guinean guitarist Ousmane Kouyaté. 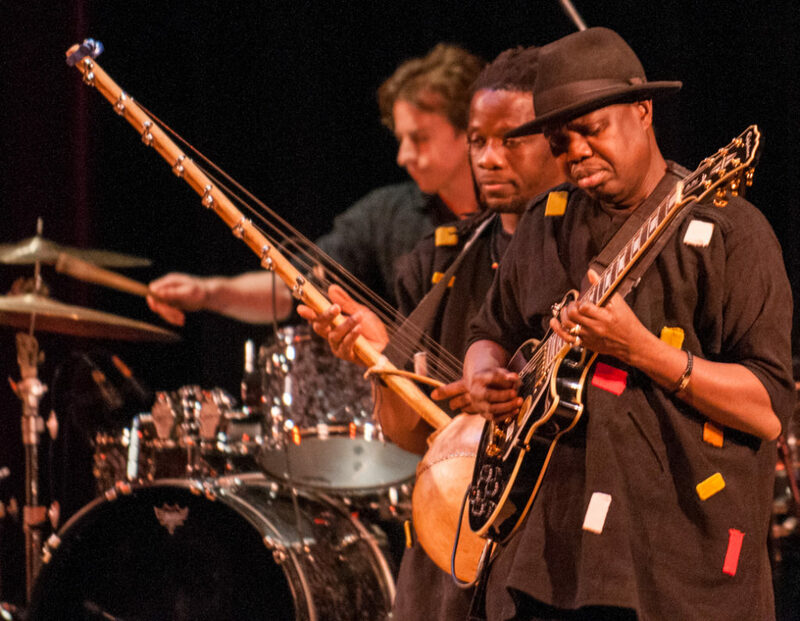 This time virtuoso kamele ngoni man Harouna Samaké returned to Keita’s side, shifting the feel away from serene griot textures more in the upbeat direction of Wassoulou and hunter’s music. 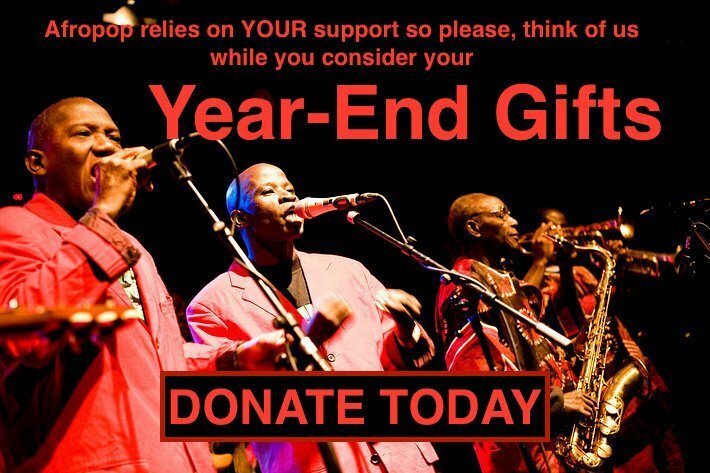 And guitarist Djessou Mory Kante, also from Guinea, commanded the all-important electric guitar position. 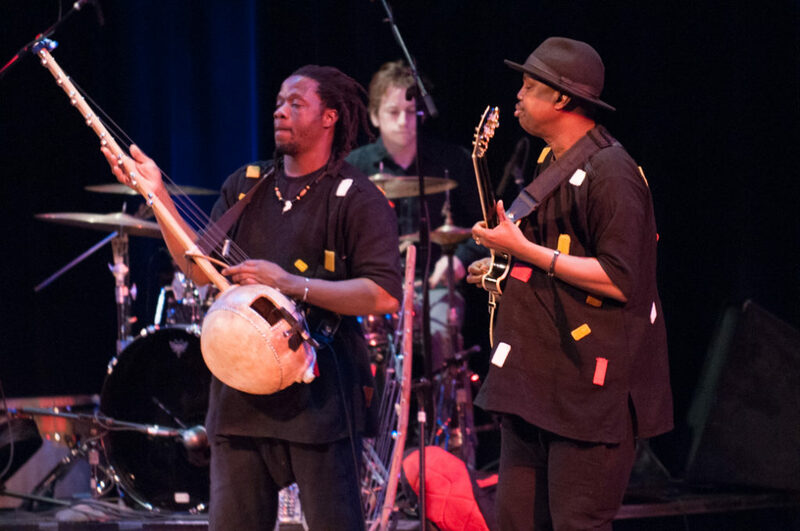 A superb player with many fine recordings to his credit, Kante worked in lockstep with Samaké throughout the night, the two clearly enjoying each other’s playing immensely. It’s interesting that despite these changes, Keita’s stage repertoire changes little. The same songs simply come out with different colorations, evidence of their inherent richness. 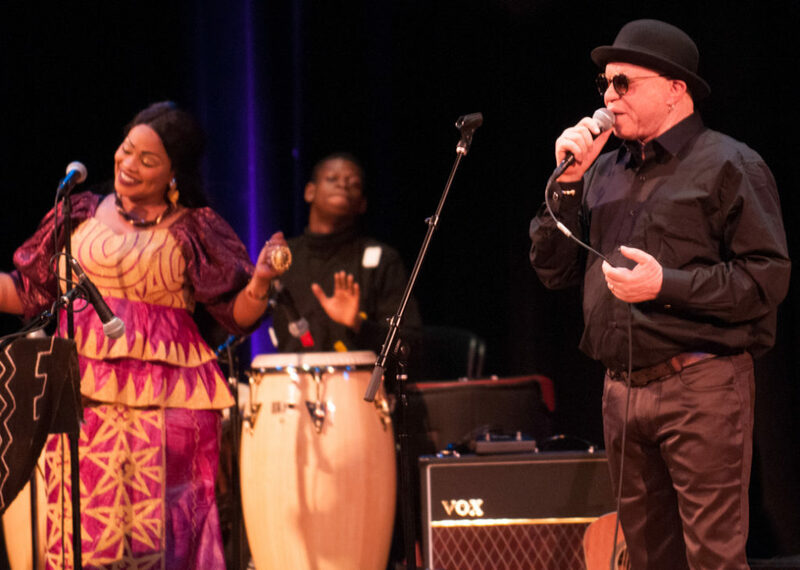 The backing singers included New York’s own Kaissa Doumbe-Mulongo, and special kudos to American Tim Keiper on drums, who did a phenomenal job, including two dynamic solos that clearly moved Keita and the rest of his all-African band. Most impressive. In the hour before the show began, I had the privilege of conducting a live Q&A with Keita as the audience gathered. 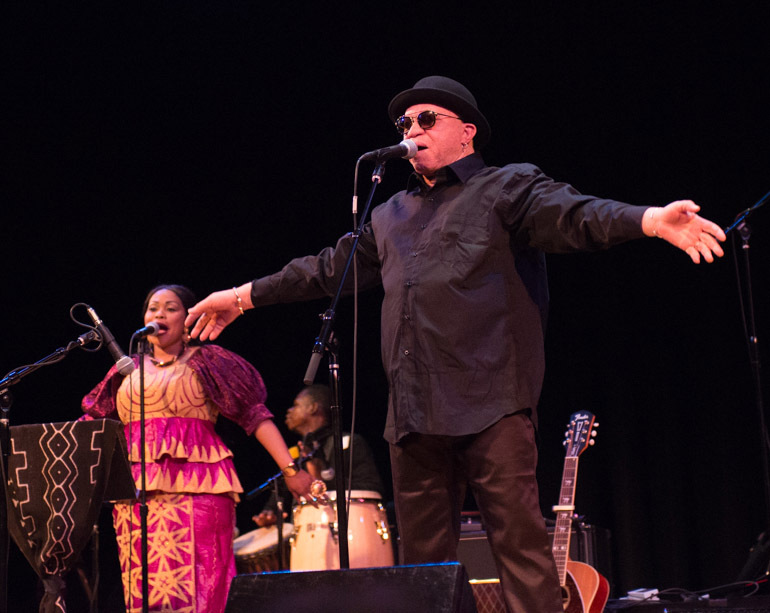 Keita reminisced about his breakthrough album, Soro, a landmark in African pop released 30 years ago this year. He talked about his songs and how they can express the deepest matters of history, morality and identity, or simply evoke uncomplicated expressions of joy and celebration. Both are essential in Keita’s creative world. 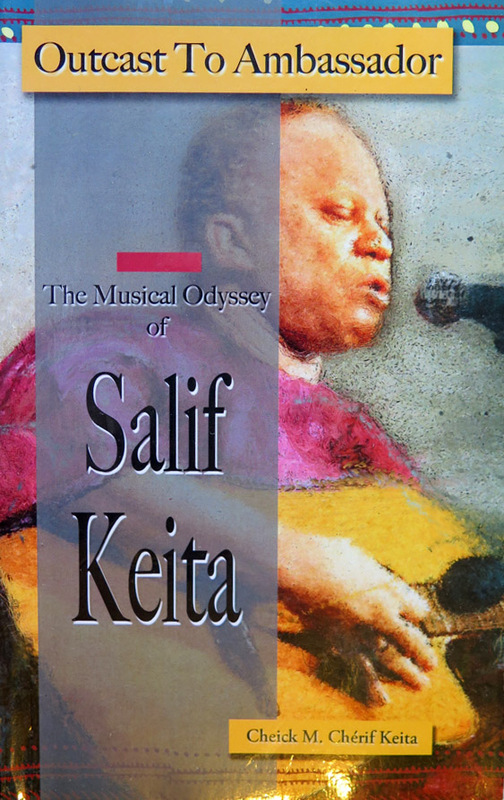 I noted to the audience that those wanting to delve deeper into Keita’s remarkable story and multilayered compositions should find Professor Cherif Keita’s superb book, Outcast to Ambassador: The Musical Odyssey of Salif Keita, highly recommended. Keita didn’t break a lot of news in this Q&A, other than putting to rest the notion that he’s retiring from touring (as he told Afropop in 2014); clearly he is not. He is working on a new album, though he wouldn’t say more about it, and he confirmed that he’s going to be basing himself in Philadelphia for the next year or so, to experience American life and musicianship. We shall see where that leads. He certainly picked an interesting year to spend among us! 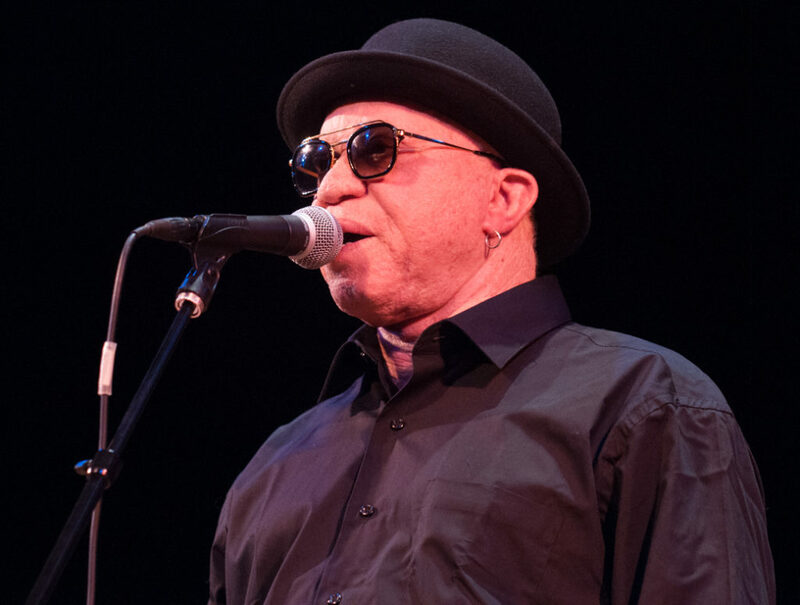 Keita spoke movingly of his activism on behalf of albinos in Africa, ostracized to the extent of being tortured and killed out of superstition and ignorance. 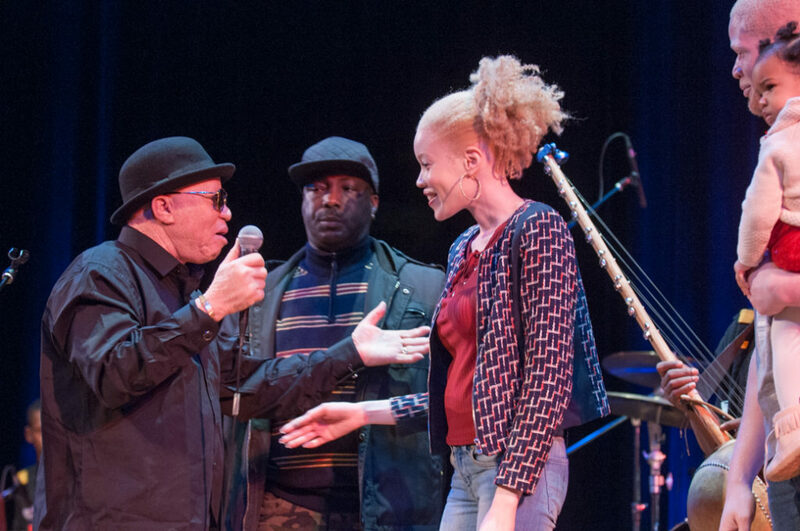 His SOS Albinism Foundation has been in place for 15 years, and he insisted that it was making a difference, mostly by raising awareness of the true facts about albinism. At one point during the concert, some friends from his foundation joined Keita on stage, and his delight and surprise at seeing them there were a treat to behold. Keita’s shows, for all their gravity and precision, always have a kind of informality about them. People come and go from the stage, not to dash him with cash, but generally to dance and greet. There were even a few mid-set selfies. The Town Hall staff did their best to keep this from getting out of hand, not always with help from the star, who has a penchant for hoisting willing dancers up to the stage. But the overall effect is unifying, making everyone present feel we are in Keita’s house, part of the party. 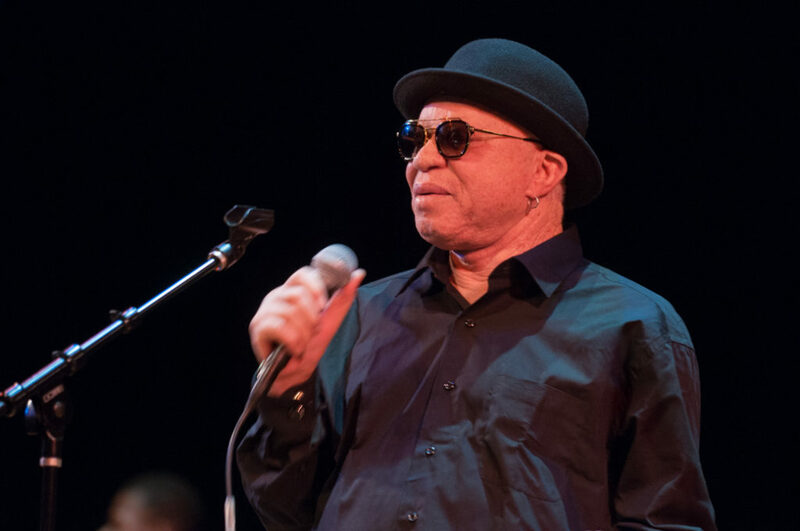 Salif Keita remains one of the most powerful popular singers in Africa, indeed anywhere. And when you see him live, it’s all about that voice and his profound music. He’s not going to dance, tell jokes, leave the stage for costume changes or really do anything showy. Instead, he projects confident humility and excellence, and reinvents once again some of the most enduring and satisfying songs in the entire repertoire of African popular music. [caption id="attachment_35768" align="aligncenter" width="599"] Tim Keiper, Harouna Samaké, Djessou Mory Kanté[/caption] [caption id="attachment_35816" align="aligncenter" width="606"] From left: translator Isabelle Dupuis, Malian singer and songwriter Salif Keita, and American musician and World Music journalist Banning Eyre participate in a pre-concert Q&A session at Town Hall, New York, New York, Saturday, April 1, 2017.